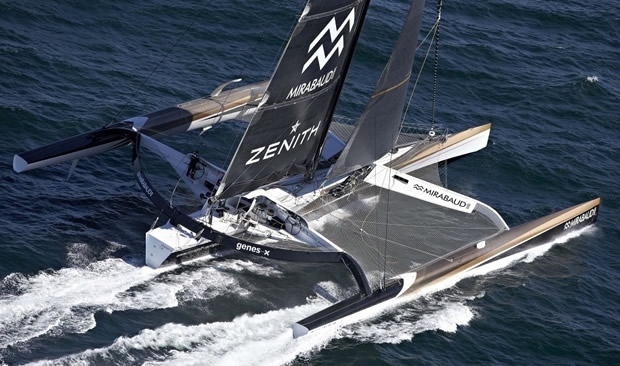 The 'Ultime' class of the Route du Rhum will provide one of the most formidable displays of sailing skill as the giant multihulls, up to the giant Spindrift 2 are sailed singlehanded from St Malo to Pointe a Pitre, Gaudeloupe. Yann Guichard, yesterday afternoon completed a solo passage west to east across the North Atlantic aboard his and Dona Bertarelli's 40m long by 23m wide trimaran. Although sailed from Newport with a crew sailing in 'pseudo-singlehanded' mode, with Guichard alone sailing the massive put into the Azores mid-way and sailed the remainder of the passage to La Trinite-sur-Mer alone, a passage that qualifies him for November's race. The stop in the Azores was also necessary to replace the starboard rudder damaged in a collision with a container drifting in the middle of the Atlantic. As soon as the boat was fully repaired, Guichard departed Horta alone at the helm. "The Azores high was positioned over the Bay of Biscay, so I had to sail west of it, taking a longer route to keep some wind. I have just spent six days alone aboard Spindrift 2, which is extremely tough, but proved feasible. The biggest unknown were the autopilots, which gave me great confidence and steered most of the time. I found my pace and, with time, you get used to the size of the boat. Anticipation remains the key, because the slightest manoeuvre requires hours of work. You can't simply make one move after another, or waste all of your energy all at once, because you have to stay lucid. When Spindrift 2 has the right sails up for the right weather, and you're gliding along over the waves, it's extremely satisfying and exhilarating." To singlehand such a massive boat the cockpit has been redesign with all the sheets and controls within easy reach of her skipper. Sail area has been reduced by around 20% and a new autopilot system has been fitted. Spindrift 2 will now undergo no further major technical changes, only minor tweaks prior to the start of the Route du Rhum. "Small improvements can still to be made to help me with manoeuvring the boat, or to make me more comfortable, but I am confident in many areas," Guichard continues. "I haven't done any sailing upwind in a breeze. By sailing regularly over the next few weeks, I will learn to do more things automatically and will become even more competitive. I will also continue to prepare myself physically, although in moderation, so that I remain suitably energised when I reach the start line. I need to be in good shape, ready to take on the challenge ahead." Meanwhile up the road in Lorient, Armel Le Cléac'h, skipper of the Maxi Banque Populaire Solo VII, has had to stand down from the Route du Rhum following a serious injury to his right hand. His doctors have told him he cannot participate, so Le Cléac'h will take advantage of the next few months to recover and focus on his new Banque Populaire IMOCA 60. Le Cléac'h commented: "It is a terrible disappointment to have had this accident. We were well prepared for this Route du Rhum and I felt ready for this great challenge, but it's like that... Now, we will focus on recovering so I'm ready for the program with the new monohull Banque Populaire when she's launched. This will be my new goal for the coming months." While Le Cléac'h will not compete in the Route du Rhum - Destination Guadeloupe, the boat still will and the team is soon to announce a replacement. Former ORMA 60 skipper Fred le Peutrec, who regularly sailed on the boat with Franck Cammas when she was Groupama 3 seems an obvious choice, however Erwan Tabarly is thought to be another likely candidate, even though he lacks solo large multihull experience.